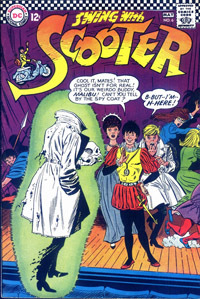 Published by DC Comics in April-May 1967, written by Jack Miller and Barbara Friedlander, with art by Joe Orlando and Mike Esposito, Swing with Scooter #6, a "hip" teen comic that would only later become a straight Archie rip-off, featured the story "Hamlet and Eggs". You can probably guess this is a Hamlet pastiche as the cast of high school kids attempt to put on a play to raise money and don't take it very seriously. Is there anything we can learn about Shakespeare's original from a jokey comic book? The plot is pretty simple and rather silly, and has absolutely nothing to do with the cover. Miss Bluff, the German drama teacher, puts the kids in rehearsals for Hamlet, and has some real trouble getting them to focus. They giggle, they start doing lines from other plays (one girl, Penny, confuses Hamlet with Romeo and Juliet, which could be an interesting idea for a mash-up since the Prince of Denmark and Ophelia are also star-crossed lovers; maybe something with the Ghost of Mercutio), fight for roles, or destroy props and sets. By the time they're selling tickets, everyone's heard it's to be a disaster and no one wants to come. Then, the comic's titular hero, Scooter/Hamlet, is inspired to turn the tragedy into... a musical comedy? Scooter's version of the play apparently appropriates lines and re-purposes them as pop tunes to create entirely new scenes. "To be or not to be" becomes a love song, for example, "To be or not to be my baby". This, perhaps accidentally, taps into meanings presents in the original text. In poetry, dying and making love are related concepts. For the teens in this book, Polonius was right: Hamlet's sanity hinges on the love of Ophelia. "To be" is to love this girl. "Not to be" is to be alone. The teen Hamlet (as opposed to the oddly middle-aged Hamlet of the play) may express his sexual frustration with jealousy for his sexually active mother and trying to get revenge for his dead father. There is something interesting as well about Penny (the second Ophelia) appropriating "to sleep, perchance to dream" since Hamlet's speech may be what eventually drives her to suicide. Ophelia's madness is represented as a kind of dream state that ties into this image as well. And finally, there's the matter of the competing Ophelias, a joke from rehearsals taken to its logical punchline on opening night. In the panel following the above page, the last we'll see of the play, there are two simultaneous fights. Hamlet and Laertes, of course, and the two Ophelias (neither dead, it seems). They're breaking character, of course, but doubling up on characters in a more serious attempt at the play could create the image of a girl battling herself. There's the dutiful daughter and Hamlet's lover, and their struggle leads to her madness and death. Unfortunately, both sides of Ophelia are dominated by men, which makes this metaphor far less useful than the Cynthia/Penny rivalry would seem to suggest. "Hamlet and Eggs" only plays it for laughs (or frankly, for the thin, occasional smile), but the play is rich enough that even a silly pastiche of it can still uncover staging ideas and meaning. Thanks for this! A delightful change of pace. I walked in on the middle of an episode of ADVENTURE TIME the other day and saw the story involved a play-within-a-play with many references to the Mousetrap and Gonzago and everything. I didn't get enough context to know what was going on in the episode or how to find it again! I'm a big fan of the Adventure Time comics, but haven't yet watched the show. Yes, I know I'm doing it backwards! But where I do, and I come across that episode, I'll be sure to include it here! Thanks I'll look it up!